a document of the plodding mind. After constructing a 40m wire dipole that works with my SDR setup, I needed to start working on a transmission system. At the heart of virtually any RF system lies a stable oscillator, and crystal oscillators are ubiquitous in many low-power (QRP) rigs simply because they are so stable. After some rough math and a lot of simulations in LTSpice, I came up with this design to give me somewhere around 7 dBm of power. The first stage is simple Colpitts oscillator topology with a “bent” 7.03 MHz crystal resonator. The 30 pF variable capacitor (C1) provides around 2 kHz of tuning. The output stage is a common-collector (Q4) and emitter-follower (Q3) with a negative feedback loop. I forget exactly where I saw this configuration, but I thought I would try it out and see if it worked. As you might have guessed, the output is loaded with higher order harmonics resulting in a waveform that doesn’t resemble a sine wave at all. 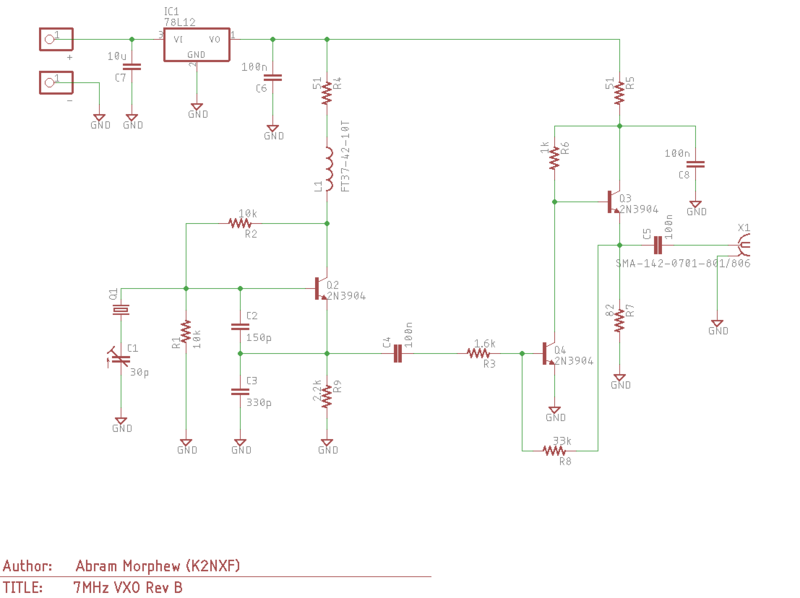 I made sure to include a simple second-order low-pass Butterworth filter on the output to filter the output. 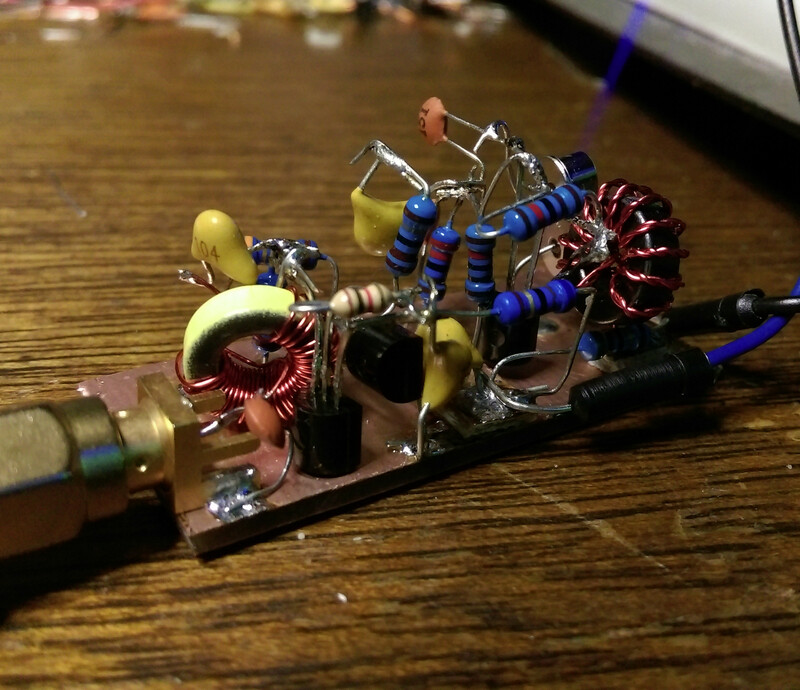 Pictured above is the ugly constructed version of the oscillator in all it’s dead-bug style. I built it on a scrap piece of double-sided FR4 and overall it’s performance came out fairly close to what LTSpice had predicted. I got around 6 dBm of output and the second harmonic is around 29 dB down (around -23 dBm). That’s not the cleanest of signals, but it’s about right for the filter. 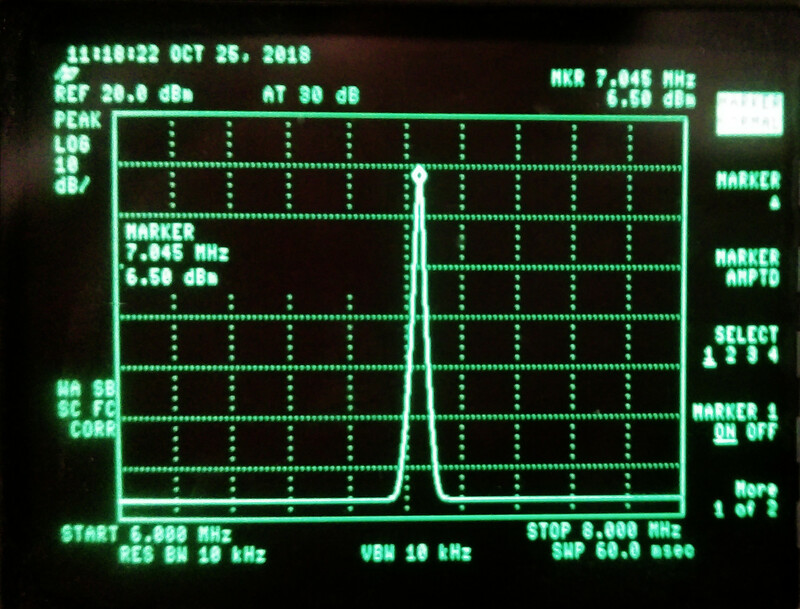 Below is the output shown on my HP 8595E spectrum analyzer. For the next phase, I’ll likely be adding control of the oscillator via an ATTiny chip. This will give me the ability to automate on-off keying of the device turning it into a simple CW beacon. One thing that could be improved is the current draw (~40 mA) from the emitter-follower at Q3. Basically, it’s a class A amplifier so it’s not the most efficient design in the world, but it provides enough power for driving an ADE-1 and could run off a small solar panel if I wanted to use it in the field. Here’s a quick video showing how I deployed a DIY 40m dipole antenna on Mt. Hood a while back. Though not the most interesting video, I think it shows the results pretty well. I used an AirSpy HF+ supplied by KK7B for a project I’m working on. A Panasonic Toughbook CF-30 helped stave off the rain. The dipole itself is two sections of 65 ft speaker wire connected to an SO-239 connector. I took a couple of sections of PVC and drilled holes in the end so I could attach some paracord and hoist it into the air. I tuned the antenna using a fancy MFJ-259C antenna tuner. Bethany and I both had very cold fingers after pulling the antenna down. I’ll be posting more on this as it develops… for real though. 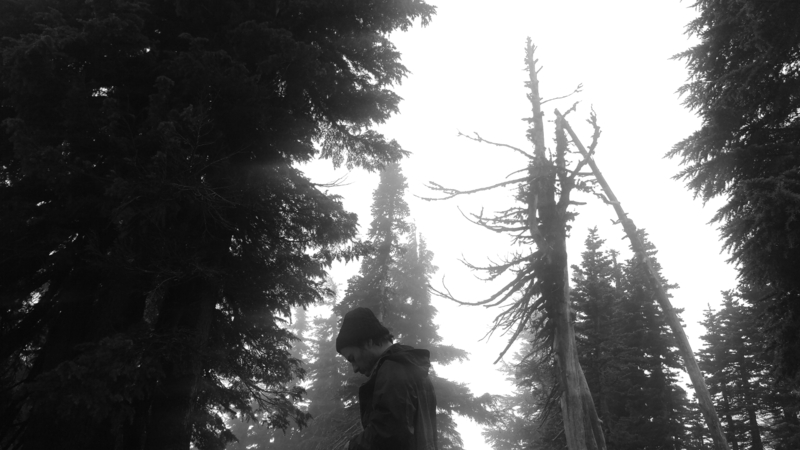 Abram Morphew is an electrical engineer, bedroom musician, composer, naturalist, and amateur scientist. I play music in the the binary marketing show. This blog is a catalog of stuff that I make or bits of information that I think could prove useful later on when memory fails me. I currently hold an Extra Class Amateur Radio Operator license and transmit on the air as K2NXF.